Recent Homeownership Developments in the U.K.
Declines in homeownership rates are not just a concern in the U.S. In fact, homeownership declines in the U.K. have been relatively larger for younger households than the impacts experienced here. 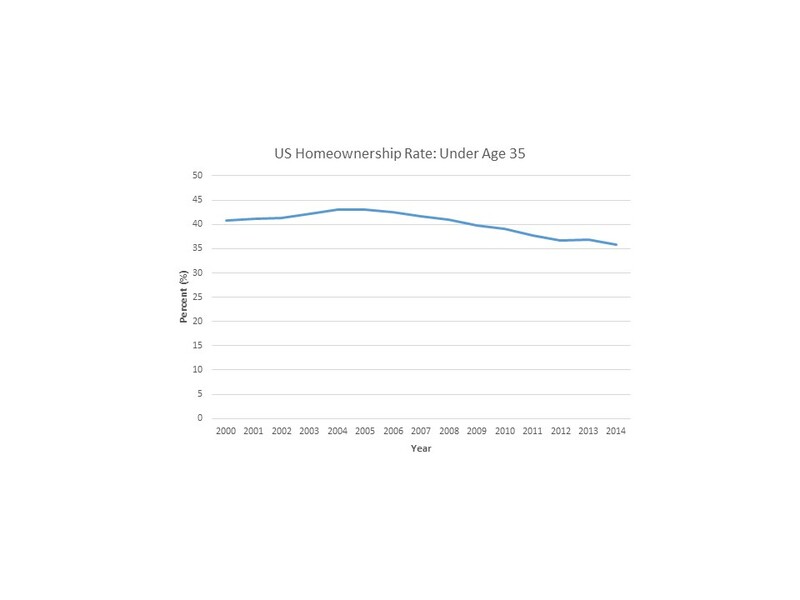 In the U.S., the homeownership rate for 25 to 34 year olds fell from 42.2% at the end of 2003 to 35.8% at the end of 2014, according to data from the Census Bureau’s Current Population Survey/Housing Vacancy Survey. In the UK, homeownership declines have been even more dramatic. Among households aged 25 to 34, the homeownership rate fell from 59% in 2003 to 36% in 2014 according to the data reported in the Economist magazine. For the population as a whole, the U.S. homeownership rate declined from 68.3% in 2003 to 64.5% in 2014. Again, the decline in the UK for the total population has been more significant. According to The Economist, the U.K. homeownership rate has fallen from a peak of 71% in 2003 to 63% in 2014. Consequently, for the first time in the U.K., a larger share of households owned their homes mortgage-free (33%) compared to those holding a mortgage (31%). In the U.S., approximately 20% of total households (approximately one-third of homeowners) own their homes free-and-clear of a mortgage. In the U.S., tight credit requirements continue to make obtaining a mortgage difficult for first-time buyers. In the U.K., the challenge for first-time buyers has generated an ambitious plan to build cut-price “starter homes.” And the British government has proposed a tax benefit linked to saving for a downpayment on certain home purchases. Under the proposal, the government will match monthly savings for a first-time home purchase by 25%, up to 3,000 pounds of tax benefits. The bonus will be available on home purchases of up to 450,000 pounds in London and up to 250,000 pounds outside of London. The consensus to date is that there has been little impact so far from these help-to-buy plans for first-time buyers. It is also worth noting that the U.K. phased out its version of the mortgage interest deduction over a number of years, ending in 2000. However, it is always important to remember that international comparisons of housing variables, like homeownership, are made difficult by not just differences in tax and finance policy, but also more fundamental differences in demographics, property law, and even cultural preferences. Tags: first-time buyer, homeownership, housing, international housing, multifamily, U.K.